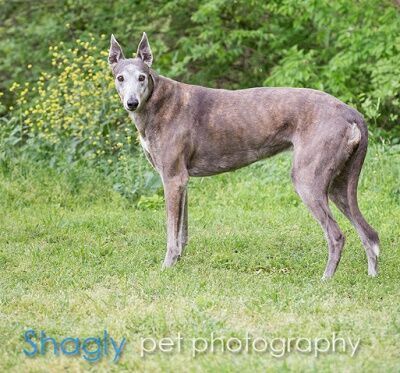 Heart, racing name, TMC’s Allheart, is a​ 9 year old brindle female born May 29th, 2008. Her sire is ​the Irish-born ​Heart Rumble​, who was quite the racer in his time. Her dam is TMC’s Jiffy. She shows 47 races on record​ in Florida​ and has whelped two litters, one in 2012 and another in 2015. ​Her beautiful white face and bright eyes are the windows to her heart. Heart is not small dog/animal or cat tolerant at this time. Sweet Heart – that’s what we call her. Heart is just the sweetest! 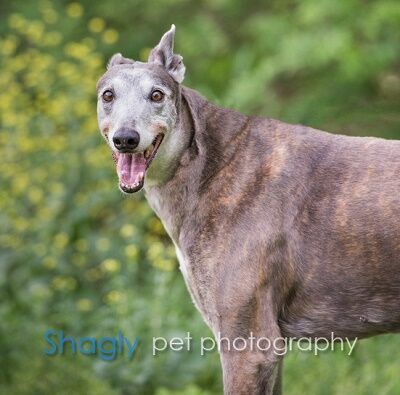 This girl is the most unusual color that I have ever seen in a greyhound. She is a medium/dark brown like a brindle, but she has no stripes. She’s just gorgeous. Heart had never been in a home before. While a really shy girl, she quickly adapted to all the distractions that a home brings. She is definitely the easiest foster I have ever had. She just goes with the flow – whatever is going on, Heart wants to be part of it. She looks to the other dogs for cues and is happy to follow what they are doing. But if nothing is going on, she’s very content to lay in the slumberball. She is not a Velcro dog, but she will be in the same room with her humans. Heart is so quiet; you may not know she’s in the house. She is not food motivated; when treats are being handed out, she will quietly come up for hers after the others have theirs and gently take a treat from your hand. Since she is so shy, she’s just coming into her real personality. She likes to play with toys and the other dogs. She loves attention and affection and belly rubs are the best. If you rub her belly, she will always roach for you. Even though she is gentle, Heart’s prey drive is pretty high, so I would say no kitties for her. Give this girl a look. She’s just starting to blossom – watch her bloom with you and your family. Do you have room in your home and heart for Heart? !